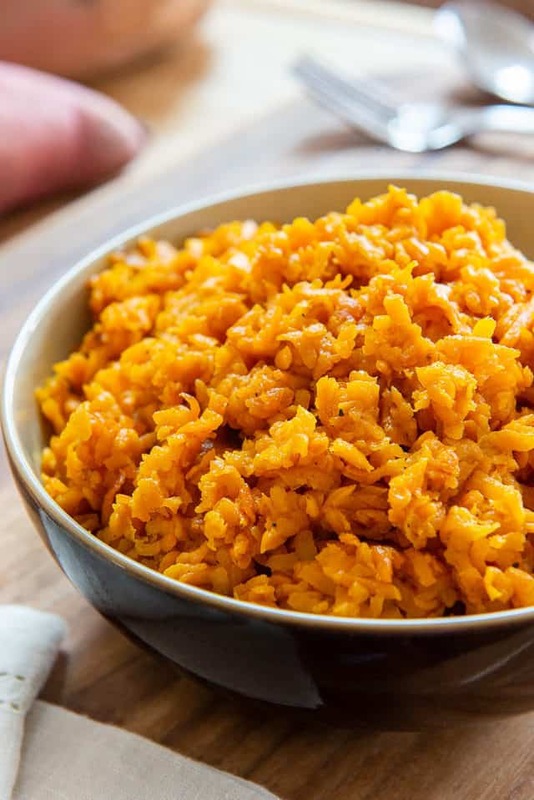 This Sweet Potato Rice is a great side dish that’s both delicious and healthy, plus it’s easy to make! I can’t even count how many times I’ve made this rice. Easily hundreds of times. 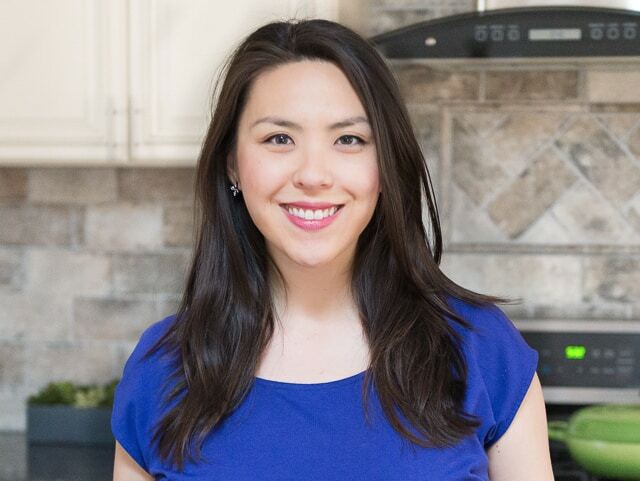 After James was born, I started experimenting with cooking every single vegetable in every way imaginable. The point being to get him to eat more vegetables, hah. From the very beginning, he LOVED sweet potato rice. It’s nothing more than shredded, sauteed sweet potato, but it takes on a really fantastic texture that’s soft but also slightly golden and crisp, and an intensified sweet flavor that is usually only coaxed out of sweet potato with a long roast in the oven. It’s a great sweet potato side dish to all sorts of meals, but can also be used as the base for on-the-fly bowl meals. Sometimes I’ll simply add some black beans, corn, thinly sliced radishes, cotija cheese, and this cilantro lime dressing, and make a meal of it. 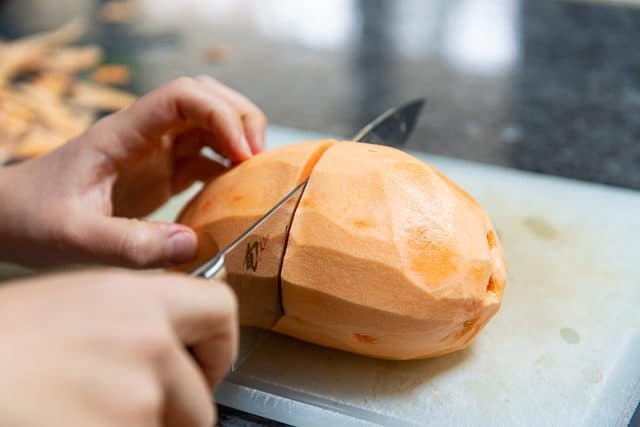 Whether or not you peel is up to you, and either way works. 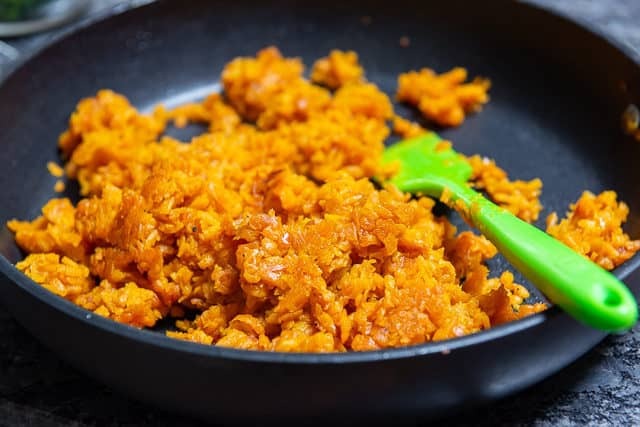 Heat a nonstick skillet over medium heat and add the sweet potato shreds, salt, pepper, and your fat of choice. Butter tastes the best, but to make it dairy-free, I use olive oil most of the time. I’ve tried coconut oil, and find the flavor to be odd when paired with sweet potato. Same with avocado oil. You’ll see that the strands start breaking up into a more rice-sized shape, as they become tender. 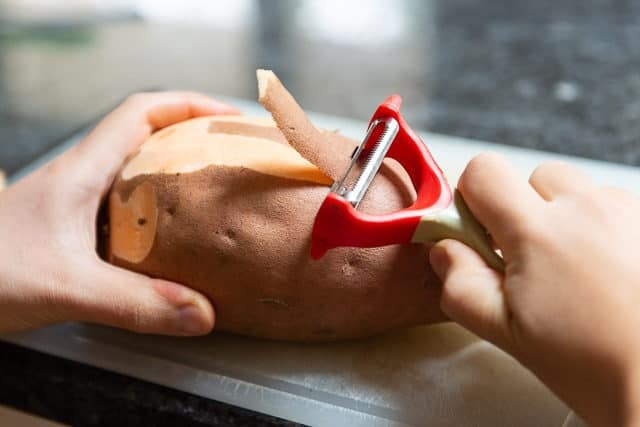 Even though the sweet potato is tender enough to eat after 15 minutes, I like to take it further to about 20-25 minutes of total cook time, until the sweet potato starts to get golden brown in spots. 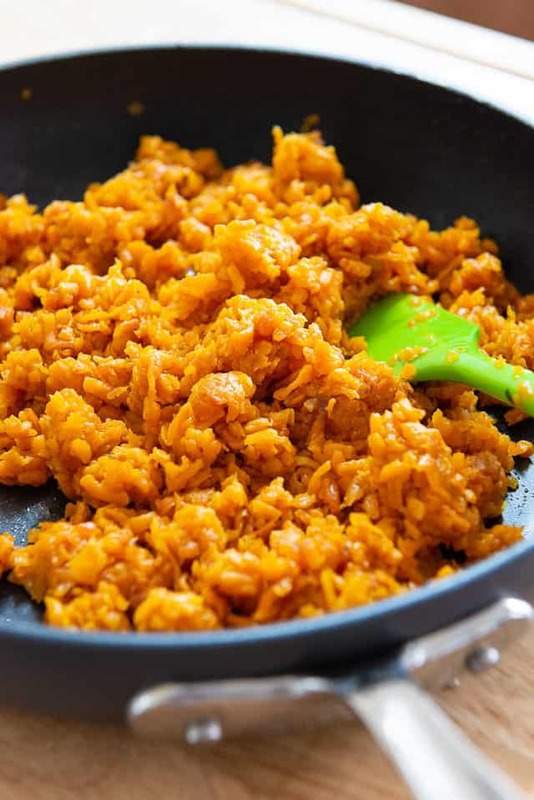 The sweet potato rice will have a soft, slightly crisp texture with a deeply caramelized, sweet taste. 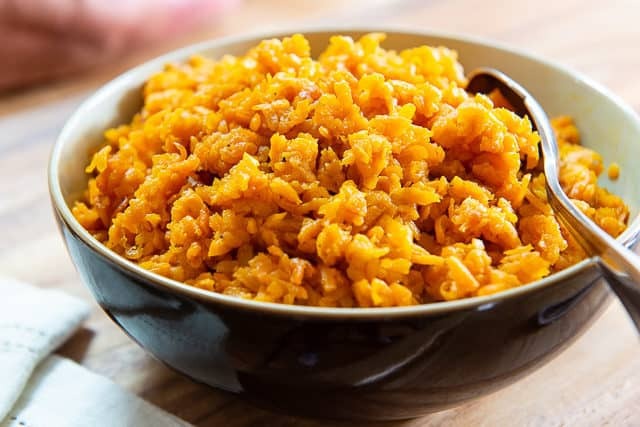 Sweet potato rice goes well with dishes like Roasted Pork Tenderloin, Steak, Slow Cooker Short Ribs, 40 Clove Garlic Chicken, and Parmesan Crusted Chicken, and with most other foods. Sometimes I use it to bulk up savory fritters like shrimp cakes or salmon cakes. Enjoy! 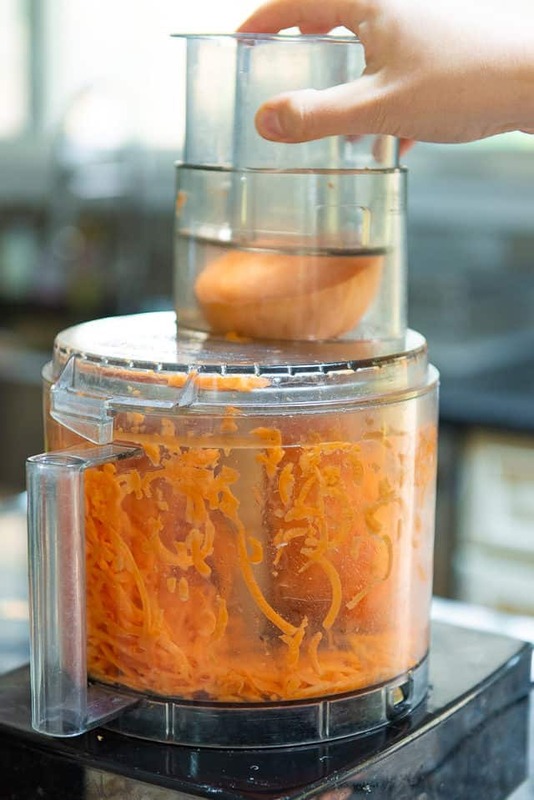 Peel the sweet potato if desired, then shred using the shredding disk of a food processor. Heat a large nonstick skillet over medium heat, and add the olive oil or butter, sweet potato, salt, and black pepper. 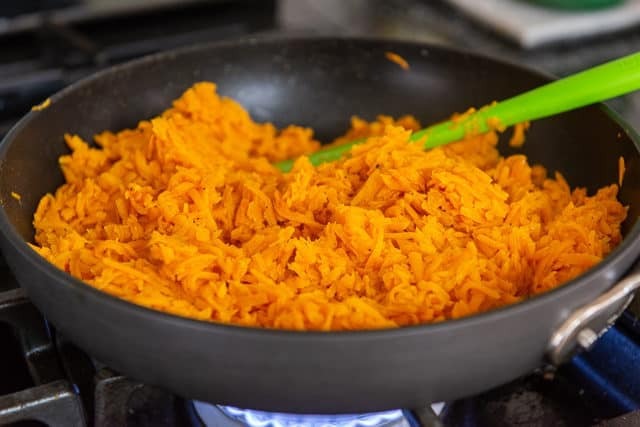 Cook for 20-25 minutes, stirring every few minutes, until the sweet potato shrinks down considerably and starts to become golden and caramelized on the edges. 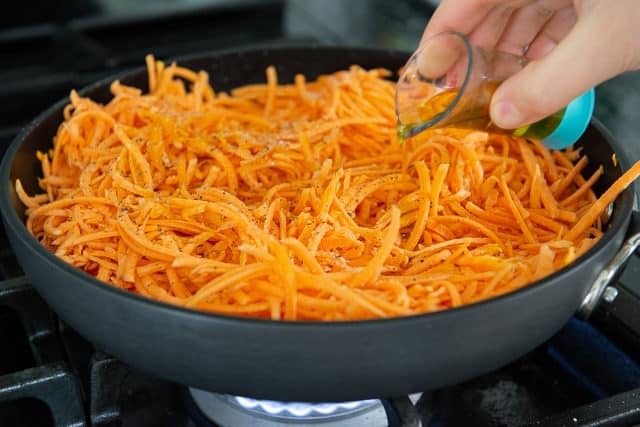 If the sweet potato starts to look dry, add one tablespoon more oil. Do a final tasting and see if it could use more salt, and season appropriately. Serve and enjoy! Must try this one, sounds great, thanks! Thanks Barb, hope you enjoy it! 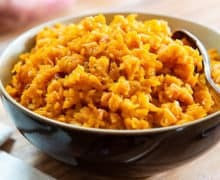 I am going to make the ‘rice’ – can it be frozen too? I want to make portions for one with the ‘rice’. I haven’t tried freezing it, but it would likely be fine, especially since it’s cooked. I store leftovers in the fridge for a few days, but they usually don’t last long because we eat it within a day.